This week’s news has been dominated by the story of the Ashley Madison data dump. Hackers, who had stolen the account information of users of the Ashley Madison adultery dating service, released the information of hundreds of thousands of men and women who had signed up to find someone to cheat on their spouse with. 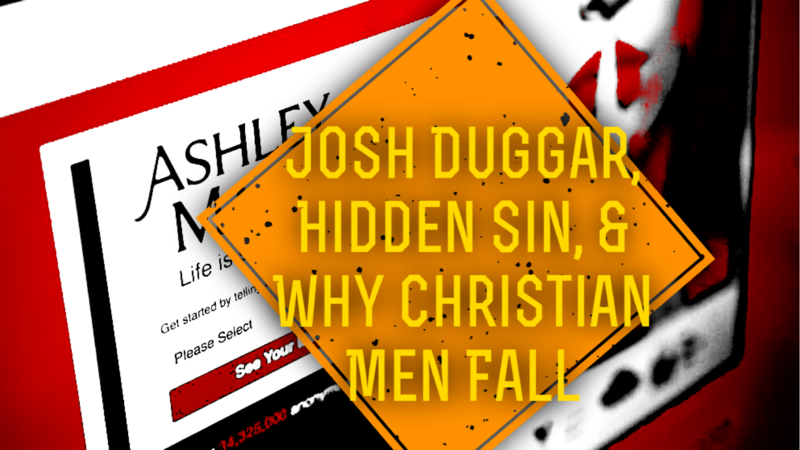 The first name to pop up in the headlines was that of recently scandalized Christian marriage/morality crusader and former reality TV star, Josh Duggar. Social media, news outlets, and tabloid websites jumped at the opportunity to denounce the hypocritical actions of Duggar. In the last week, I’ve seen folks claim that all Christians are hypocrites, that Christians are the source of most social ills, that this is further proof that Christianity is a scam, folks have dismiss Duggar as a pervert, and all sorts of other vitriol. Folks who’d previously defended Duggar are conspicuously silent, many not knowing what to say after defending the man in past months. I believe that many Christians reach a point where they expect men to be sinless, instead of knowing that men can easily fall. We need to remember that Jesus is Jesus and we are not. No one is-except Jesus. I’m not trying to excuse the guy’s sins or dismiss him. Frankly, it’s not my job to deal with him. I’m neither his pastor nor his family. It’s unlikely he’ll ever read this. I will say that we need to acknowledge the seriousness of sin and judge ourselves by a higher standard than the world. We can’t wag a moralizing finger at the lost while whitewashing and excusing our own sins. It’s not right. Instead, we should take the opportunity to properly explain repentance and grace. More on that in a future post. Personally, I’ve been watching the whole thing and feeling sorry for the man’s wife and kids, who will bear the public shame and humiliation of Josh’s actions. In addition, I’ve found myself thinking about how this happens. Whether or not ministers are statistically more likely to get caught cheating, it’s certainly news when it happens. As a guy who works in ministry, I pay attention whenever I hear about it because I’m genuinely bothered by it. For starters, it reflects badly on Jesus and His church. It also raises the specter of potential in my mind. Men that I like and respect have had these sorts of moral failings, so it follows that it could happen to me as well. I’ll admit that I’m very aware of the potential. I don’t think any of these guys planned to cheat on their wives or that they lived their whole lives as con artists, faking their faith in order to trap a wife and get a low paying pastor job. (Though, oddly enough I had a stranger accuse me of that once.) Rather, through observation, I’ve collected some common traits that make it easier for Christian men to fail morally. A marriage that isn’t top priority: It’s easy for marriage to fall lower on the priority list, behind work, children, image, success, etc. The only thing that ought to rank higher is my commitment to follow Jesus, which in turn governs my relationship with my wife. Specifically, husbands are to love their wives as Christ loved the church. When spouses fail to meet each others emotional needs, affairs become more likely. Imitating Christ in marriage means serving each other mutually, caring for each others needs. Willard Harley wrote 2 excellent books on the topic, Love Busters and His Needs, Her Needs. I’d highly recommend them both to any married couple. Disclaimer: This isn’t to blame the situation on wives. Each man’s sin is his own. It’s rather to point to a real factor that leads to affairs and offer a tool to ensure it never happens. Radical Honesty: There are several people in my life, including my wife, several pastors, and a few other men, with whom I practice radical honesty. I tell them every rotten thing I think or do. Sin grows in the dark. The more I hide, the more likely I am to fall into sin. Maintaining several relationships of radical honesty is vital to safeguarding integrity. Maintaining Good Boundaries: If I were a sleepwalker, I wouldn’t ever go camping at the top of the Grand Canyon. I’d be afraid of walking off a cliff while sleeping. I’m not a sleepwalker, but I am a sinner. I sometimes do sinful things in moments of colossal moral sleepwalking. Because of this, I do not do counseling with women in places where I cannot be interrupted. I don’t spend lots of time alone with women who aren’t my wife. I maintain strict rules about where I go and with whom. This keeps me from moments of stupidity. Through my work as a chaplain and as an addiction counselor, I’ve learned a great deal about and from Alcoholics Anonymous. It’s often said that AA is simple: Go to meetings, find a sponsor, and work the 12 Steps. The challenge that many folks face when they start going to AA meetings is that they don’t want to get a sponsor or work the steps. Alcoholics often struggle with interpersonal relationships and authority, which makes finding someone to have an honest relationship of accountability with daunting. It’s not uncommon for alcoholics to try to go it alone for long periods of time without ever reading the AA Big Book or working the steps before finally breaking down and finding a sponsor. The most common reason alcoholics eventually enter a relationship with a sponsor and work the steps is that they recognize that their drinking and destructive patterns will destroy everything in their lives if they don’t overcome it. Desperation to escape slow death at their own hands drives them to reach out to another recovering alcoholic to get help in achieving lasting sobriety. Working with someone else, who has overcome similar struggles, works. They understand each other based on shared experience and are able to point each other toward spiritual growth, which is the most important component of the AA approach to recovery. As a pastor, I’ve long been aware of the Biblical roots of the AA approach to recovery. The alcoholic acknowledges that they can no longer control their lives, turn control of their lives over to God (who is more powerful and able to control their lives), they then confess their past moral failings and seek to make amends with those they’ve wronged. This is essentially the Biblical path to salvation: acknowledge that we are sinners, turn our lives over to Jesus, confess our sins after a fearless moral inventory, then do our best to make it right, while continually striving to overcome our sins. Sponsorship is discipleship. Discipleship is when a believer finds someone- a more mature believer to help them train, grow spiritually, and overcome sin in their efforts to be imitate Jesus. The unfortunate reality is that despite the fact that AA sponsorship is an imitation of Christian discipleship, it is far more common in AA groups that discipleship is in churches. Christians just don’t look for relationships of accountability and spiritual training in an effort to grow in Christ and overcome sin. The desire to overcome moral failings isn’t present in churches in the same way that it is present in AA. This is despite the fact that discipleship is the basic method of spiritual growth and training presented in the Bible. It is how Jesus grew believers and how the church grew disciples for centuries. I’d suggest that the reason for the lack of discipleship in the modern western church is simple: we aren’t overly concerned with overcoming sin, growing in holiness, or imitating Christ. It’s important to enough to many believers that they might read a few books a year and attend church to listen to sermons, but this is often seen as “good enough.” Serious training to grow spiritually just isn’t often yearned after amongst believers. This is the same reason that there are around 4.4 Bibles for every household in the U.S., but only around 26% of the folks who own Bibles and identify them as important, read them. The folks working the steps in Alcoholics Anonymous see their addiction as a death sentence, so they find folks to disciple them in their spiritual growth as a means of escape. It is far too common for Christians to see overcoming their sins as an optional add-on to the faith or something they ought to do in the same sense as they ought to floss and lose weight. They do not see sin as a road to death or as utterly offensive to God. This general disinterest with overcoming sin is reflected in the literature the church consumes en masse, which tends to focus on how to be happier or more wealthy. Books dealing with imitating Jesus and obeying his commands are far less common and seldom approach the Christian best sellers list. It is often the case that when we preach/write about sin, it is focused on “wicked” groups outside of the body of Christ, rather than on our own failings. The church is content to point to the sawdust in the eyes of others, while ignoring the log obscuring our vision. We are pleased with Jesus as Savior, but uninterested in Him as Lord. Until following Jesus becomes the burning desire and priority in our lives, the church will continue to neglect discipleship. We must learn to detest our own sins and see overcoming them as escaping from death. Last weekend, I baked chocolate chip cookies for a tea party I had with my kids. I don’t bake cookies particularly often and don’t have an old family recipe, so I went to the internet and followed the instructions on the first recipe I clicked on. Several hours later, when we sat down to eat the cookies, it was difficult to miss the fact that something had gone wrong. They didn’t taste bad, once you gnawed through the cookie to get a taste, that is. It was undeniable that my cookies could be used as rocks. My 19-month old spend over an hour gnawing on his cookie, and only managed to consume half of it. The next morning, I discussed the baking project with some ladies from church and quickly zeroed in on the problem: softened butter doesn’t refer to butter melted to liquid in the microwave. I didn’t want to wait a couple of hours for butter to soften naturally, so I sped up the process using a power tool at my disposal. As reasonable as it seemed at the time, my one ingredient mistake had rendered the cookies inedible. They looked pretty good. They smelled as good as fresh baked cookies ought to smell. They just weren’t right. It wasn’t even a wrong ingredient. It was a correct ingredient in the wrong state. I have seen a similar phenomena in my own life and in the lives of others during my 16+ years of ministry work. It is an ingredient that is wrongly added (or not added at all) in the lives of Christians, which results in something that looks and smells pretty good. However, it is associated with a hardness in the heart and life that is tough to miss. If you spend time in a church or interacting with believers on the internet, you will encounter those whose words and deeds are not in harmony with what the Scriptures direct. Pettiness in interpersonal squabbles, judgmental attitudes toward others, a lack of self examination and dealing with personal sins, and all manner of other inconsistencies are symptoms of a missing or wrongly added ingredient.This ingredient is “discipleship.” Discipleship refers to a lifelong process of following Jesus and subordinating our lives to His teachings. Mind you, I am not talking about following the ten commandments or pointing out the sins of others wherever they turn up. I am referring to a lifelong training effort to live a life of service to God through application of the teachings of Jesus in faith. Mind you, this isn’t a “just do these things” type existence. Jesus does not disseminate a new collection of rules for believers to toil under. Discipleship is learning to live this way through following Jesus in gratitude for the grace we receive in salvation. It is conforming our hearts to Jesus, an intentional process that Christians commit to as a part of following. When the Lord invites believers are to take his “yoke,” he is using a figure of speech typical to ancient Israel. A rabbi’s yoke was their teachings. He is literally instructing his followers to take his teachings on themselves. The yoke of his teachings are light in contrast to the crushing legalism of the Mosaic laws. In Christ’s teachings, the teachings shift the believer from a focus on “thou shalt not…” to a directive to love God and love your neighbor. This is more than a sentiment or lips service. It’s something that needs to translate into new action and a new way of living that flows from a heart made new. Going to church, reading the Bible, feeding hungry people, striving to not sin, taking care of the sick, sharing grace with folks who find themselves stuck as a result of destructive decisions, and all the other trappings of Christianity are not discipleship. They may be part of the picture, but they are not the whole thing. They can be the inviting smell and attractive appearance of the Christian life, but without discipleship, they are far less than the whole thing and can result in the sort of hardness of heart that folks often complain about in relation to Christians. Discipleship involves prayer, studying the scriptures, submitting to accountability relationships, confession of sins, and all manner of other practices aimed at bringing the believer’s heart into conformity with that of Christ. A Boy Named Sue is one of my favorite Johnny Cash songs. Most people are familiar with the tune, but for those who have never encountered Cash’s humorous song, it tells the story of a man whose father was a worthless drunk who abandoned his family. Just before leaving, the drunk cruelly named his son “Sue.” The monicker brought teasing and mockery from an early age, which forced Sue to get tough, fighting anyone who picked on him. Intent on revenge for his unfortunate name, Sue hunts down his father with murder in his heart. Eventually, Sue finds and attempts to kill his father. Before he dies, Sue’s dad explains that the name was intended to toughen his son up, because he knew he wouldn’t stick around to help him learn to be a man. Sue realizes that as much as he hates the terrible name, it has made him into the man he is. The song ends with Sue walking away with a different point of view, thankful that he learned to fight and win through his difficulty. I relate the content of the song because, though humorous, it makes an interesting point. Over the years, I have counseled with many people who curse bad parents, lament difficult circumstances they went through at different points of their lives, or rage against God for past hurts. Often, these hard circumstances in their lives resulted in them growing resentful or carrying a grudge. In such cases, I usually point to Johnny Cash’s song. I have never met a person who went through difficulty without growing strong, learning important skills, developing a deep sense of empathy, encountering God in a meaningful way, or developing a deep and abiding spirituality. Often, these qualities remain unnoticed in the individual because they simply accept them as a part of surviving hardship. In reality, some of the best qualities in people develop from going through difficulty. Diamonds are formed with intense heat and pressure and gold is refined with intense heat that burns away impurities. Further, God often uses our areas of brokenness to minister to the needs of others with similar issues. There’s a reason Alcoholics Anonymous is so effective. It’s because God is able to us alcoholics’ past brokenness to help deliver other alcoholics from their addictions. I have spoken to all sorts of believers who have effectively ministered from their own broken past, regardless of what the brokenness in their past is. There is an important principal in this. Comfort, a sense of meaning, and purpose for difficulty in relation to hard circumstances in our past can be discovered by recognizing God’s refining us through the pain we experienced, reflecting on the good it produced in us, and reflecting on how our experiences have shaped us into the person that we are. Doing so requires that we learn to take a different point of view in relation to our past. This can be terribly difficult, because hardship often creates bitterness, which tends to blind us to anything positive that may come of unfortunate incidents. It can also be hard because it’s easy to confuse finding positive outcomes with being glad a bad thing happened. We don’t have to be happy that tragedy has been present in our lives in order to recognize how hardship has shaped us. We can be thankful for what we have become without having joy at what made us the way we are. Learning to shift our perspective in relation to past pain can bring great comfort and release. As difficult as it is, it becomes easier to shift our perspective the further displaced we are from the events. This is often the first step toward healing. This is a rewrite of a column I wrote that was published in the mountaineer in July of this year. “If I could just move to Florida, then I’ll be happy.” These words were spoken by a young man I was working with in a rehab program. He was a drug addict, had a list of convictions longer than my arm, his family life was a disaster, he was financially destitute, his education and job skills were non-existent; but he firmly believed that a geographical relocation was going to solve all of his personal woes. In reality, moving would change nothing. You simply cannot run far enough away to escape yourself. He was his own problem. His drug addiction was destroying his life. However, the work needed to deal with the problems he had accumulated was far more daunting than simply moving. This is an example of miracle thinking. Miracle thinking is essentially when a person comes to believe that their problems will be solved by accomplishing a simple, often unrelated task. Miracle thinking comes in all sorts of shapes and sizes, but the common factor is that it generally doesn’t directly address or solve the presenting problem. It’s an easy option. I have spoken to people who believe that if they can just find Mr. or Mrs. Right then they’ll be content, or if they could just change jobs they’d be happy, or if they could get a new spouse they’d stop drinking. The specific form of the miracle can vary, but it usually involves externalizing blame for problems/feelings and a way out of the situation that is often unrelated and easier than dealing with the real problem. In reality, a single, depressed person who enters a new relationship may experience a flush of enjoyment, but will ultimately wind up depressed again. An alcoholic who moves to a new community will just find a new place and people to drink with. Miracle thinking is a thinking error that is not confined to problems like chemical dependance. People use miracle thinking in relation to debt, marital difficulties, depression, weight problems, anger issues, and all sorts of other issues. Figuring out if your solution to a problem is miracle thinking is difficult, and usually requires an outside opinion to help assess the thought. Outside feedback should come from a person who will be forward and honest enough to explain whether or not a planned solution is realistic or likely to pan out. In addition, the individual ought to have a history of making healthy choices. This sort of evaluation is especially important if an individual is dealing with an issue that is particularly difficult or if you recognize a pattern of drastic solutions that simply don’t work out. The difficulty in self assessing thinking errors, like miracle thinking, is due largely to denial and clouded thinking that is typical among addicts. Self assessment is best accomplished by asking exactly how the solution will resolve the issue at hand. If the explanation is not likely to pan out as true, if evidence from past situations suggests that the solution is viable, or if it will not logically produce any real change; then it is likely miracle thinking. Its important to understand that miracle thinking isn’t a result of a person being crazy or broken. Instead, it comes about when a person’s thinking is clouded by strong emotions, stress, exhaustion, or mental protections of an addiction. Regardless of whether or not miracle thinking is an issue, the practice of consulting with others for advice when dealing with major issues is a wise practice.